A resurrected marque receives an interior makeover and delivers a superyacht feel. In 2014 New Ocean and Seattle broker Martyn Snyder and his wife resurrected the marque. They updated the design and tooling and brought in Seattle interior designer Sylvia Bolton to update the interior. Bolton applied her more than three decades of experience in vessels such as Mazu, Anaya, Serenity and Rhapsody, and the results are truly striking. Regency models are now available from 60 to 96 feet and, like most vessels in that size, prospective owners can select from a number of general arrangements, flooring, carpeting, woods, veneers, fabrics, soft furniture and appliances. Hull structure is based on both longitudinal and vertical fiberglass stringers that are laminated to the hull. The hull itself is solid glass below the waterline and cored glass above. Divinycell PVC coring is used above the hull waterline and on the decks, deckhouse and command bridge. This type of construction yields a strong, stiff, lightweight, quiet-running hull that resists flexing and twisting under most conditions. 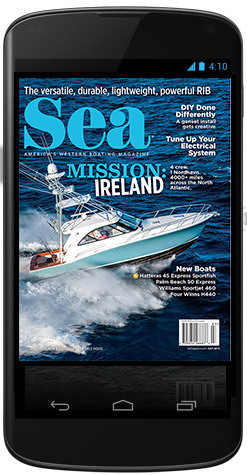 The hull/deck connection, a source of problems on many boats, will not be on this one. The shoebox-style connection is bedded in 3M 5200 adhesive sealant, one of the best adhesive sealants in the industry, and then through-bolted every six inches with stainless nuts and bolts. The exterior of the hull/deck joint is then glassed over with three layers of laminate. The exterior glass work on our test P65 was excellent — fair, smooth and without haze or print-through. The glass work on the hull/deck connection was undetectably different than on the rest of the hull. 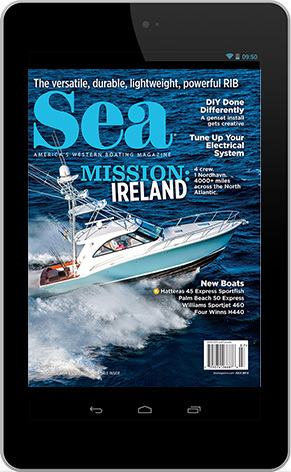 Access to the vessel is easily gained by stepping from the dock to a swim platform that is almost the same off-the-water height as most docks, which makes boarding quick, safe and easy for boaters with young children or aging parents. Provisioning and moving equipment or appliances on or off the vessel is easy as a result, too. Stairways to port and starboard off the swim platform lead up to a teak-soled, covered cockpit. A transom door, off the swim platform, provides easy access to the large lazarette. The cockpit is laid out for comfort and entertaining, with one unique feature. On one of the most beautiful teak tables I’ve seen in a long time sits a large, elegant ice bucket capable of easily holding half a dozen beers or a couple of bottles of wine. Ice buckets on a boat can be a problem. They generally fall off whatever they’re sitting on as the vessel moves along. Beer spills and wine bottles break. This ice bucket is firmly fixed to the table. Ice buckets firmly fixed to any surface have a problem. How does one dump the water out as the ice melts? In the case of the Regency P65, the ice bucket drains through the table stand and over the side. I found the same attention to detail throughout the vessel during our test. Port and starboard helm controls are hidden away in the aft wall of the deckhouse, to make docking and marina maneuvering easier. The cockpit, despite having a lot of built-in seating, has plenty of room for additional chairs. It is clean and uncluttered, and access to the command bridge is up a teak-stepped ladder from there. Ample sidedecks with raised bulwarks and solid handrails make getting to the foredeck quick and easy. 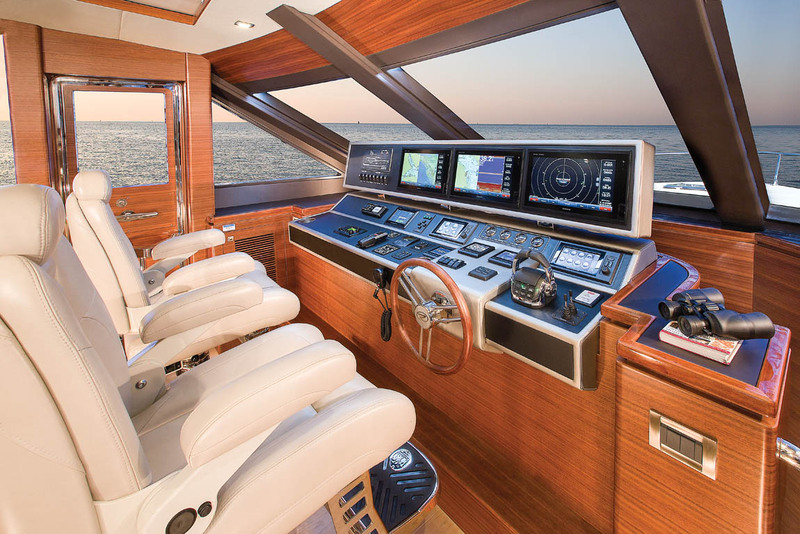 The foredeck boasts a feature that is usually limited to much larger vessels: a forward-facing settee built into the deckhouse. A table, complete with a built-in umbrella stand, makes the area great for lounging, sipping cocktails or noshing on a snack. The command bridge itself is large and comfortable and is an excellent entertainment area, well protected by a hardtop. Once again we find features that are normally found only on larger vessels. The P65’s command bridge has what has been called a beverage area, which is really a mini-galley, complete with a granite countertop, a sink, a refrigerator/icemaker, hot and cold running water, cabinet storage and an overhead TV. Toward the aft of the command bridge lives a barbecue center with a propane grill. All that was missing on test day was a bartender and a chef serving up hot food. The new P65 can be comfortably operated from up top. Twin Garmin 7616 multifunction touchscreens display vessel operational and control information. Sometimes controlling a vessel from a command bridge can be difficult because of a bow “sight shadow” that obstructs forward visibility close to the vessel, but close-in visibility was not a problem. 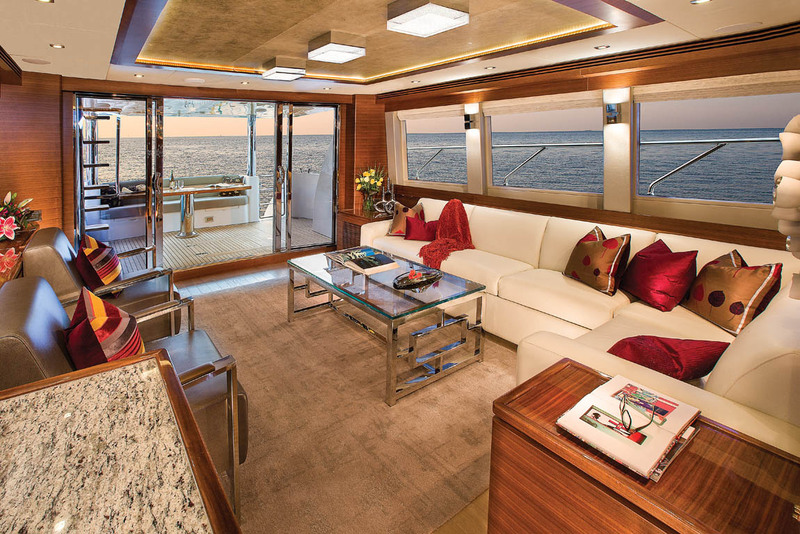 Interior designer Sylvia Bolton was given free rein with this 65-footer, and the results are impressive. One of the most striking features is the grain in the walnut cabinetry, which runs horizontally rather than vertically as in most other vessels. 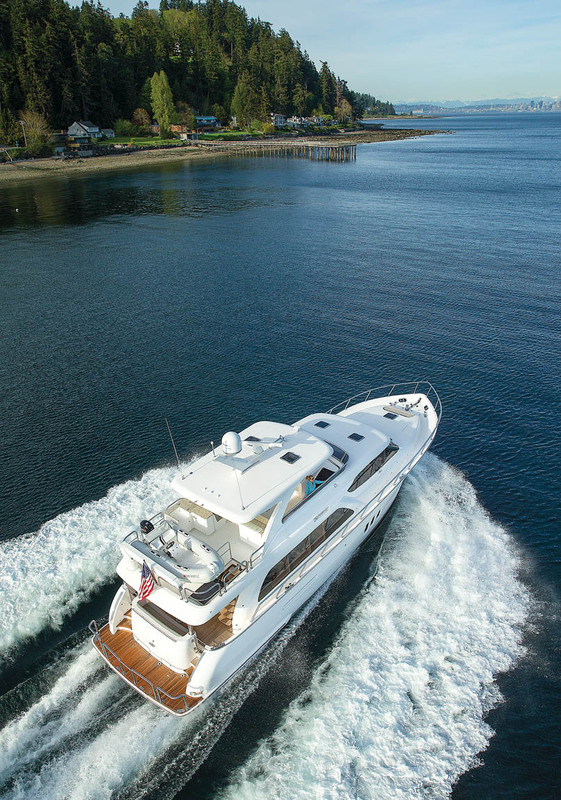 Bolton borrowed that feature from the 146-foot Ron Holland–designed Mazu, which she also designed. Seven-foot ceilings, gray washed-oak floors, beige leather and ultraleather seating, and glass and stainless coffee tables give the P65’s salon the opulence of a first-class private club. The original pieces of wall art add to the ambiance of the interior. The general openness of the deckhouse layout, with no bulkheads between the pilothouse and the rest of the deckhouse, means the skipper has a view from the helm right through to the back deck. The galley, because it is situated immediately aft of the wheelhouse, is bright and cheery, even on dull days, and the cook can be part of the activities even while preparing snacks or a full meal. The galley features plenty of easily cleaned granite countertops, top-of-the-line appliances, a four-burner induction cooktop, an oven, a refrigerator and two drawer freezers, a microwave, a garbage disposal and a trash compactor. Overall, the galley is better designed and features better quality appliances than most shoreside kitchens. The accommodation deck is accessed from the pilothouse down an elegantly curved stairway that “lands” on a foyer, something very rare on a vessel of this size. The fit and finish in that space is as good as in the rest of the vessel. Think book-matched walnut doors, walnut paneling with white and beige accents, and original wall art. The foyer, from which all staterooms are accessed, contains plenty of cabinet storage for towels, sheets and linens and features a washer and dryer cabinet. The full-width en suite master stateroom, which features an island king bed with side tables, a large bureau with plenty of storage, and a full-sized walk-in cedar-lined closet, is located aft. Three hull windows, port and starboard, flood the stateroom with natural light. The fully carpeted VIP stateroom, located forward, is complete with an island queen bed, a hanging locker, opening portlights to port and starboard, and a skylight. The third stateroom, complete with twin beds and a hanging locker, features twin beds, washed-oak floors, opening ports and a generous hanging locker. The mechanical space can be accessed via a cockpit hatch or through the lazarette. The engines are mated to a ZF transmission and three-inch stainless shafts spinning five-bladed props. Each engine is protected by stainless safety rails, which, combined with adequate spacing, allow for easy routine servicing. 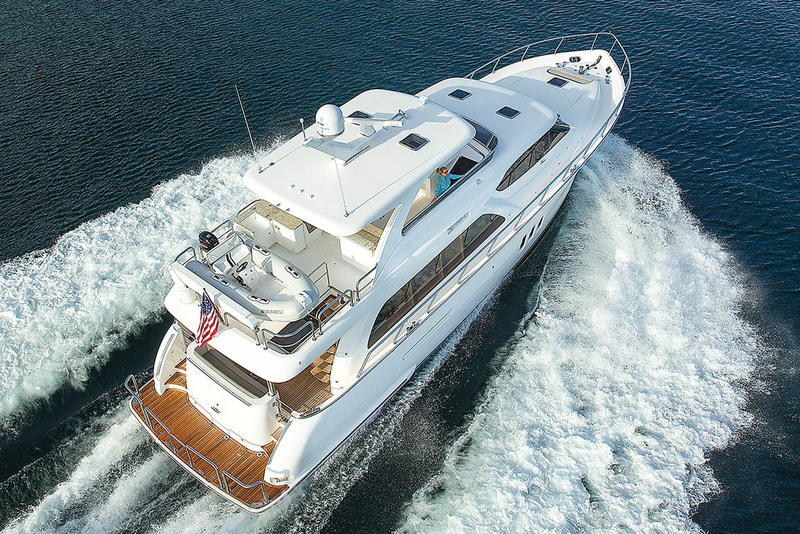 The engine space is also the home of two generators, 16 and 20 kw, a hydraulic system for the bow and stern thrusters, a furnace and the air conditioning. All components are available in the U.S., so repair, parts replacement and servicing should not be a problem. The twin Volvo D13 diesels fired up instantly, and with the assistance of the thrusters we easily threaded our way through a crowded marina into the fairway. The vessel was very quiet as we headed for open water. At 1000 rpm we ghosted along at 8.6 knots with a fuel burn of 8.5 gph. At 2000 revs the yacht was well on plane at 16.3 knots and the 900 hp engines were burning a combined 56 gph, which is not an unusual amount for an 1,800 hp, 45-ton boat. The boat responded smartly to all helm inputs and visibility was good all around. The vessel continued to be very quiet, even at its top speed of 21.6 knots. During our test we brought the boat to a complete stop, put the helm hard over and, keeping it there, slowly increased the rpm. The vessel tucked itself into a flat turn in just more than its own length and continued without skip, skid or chatter. Clearly the drive line was well matched to the hull. This vessel is beautifully finished throughout and has features normally found on much bigger boats. It performs well and its equipment throughout is first class. It’s quiet and comfortable underway, and the open layout encourages passengers on board to interact with one another. 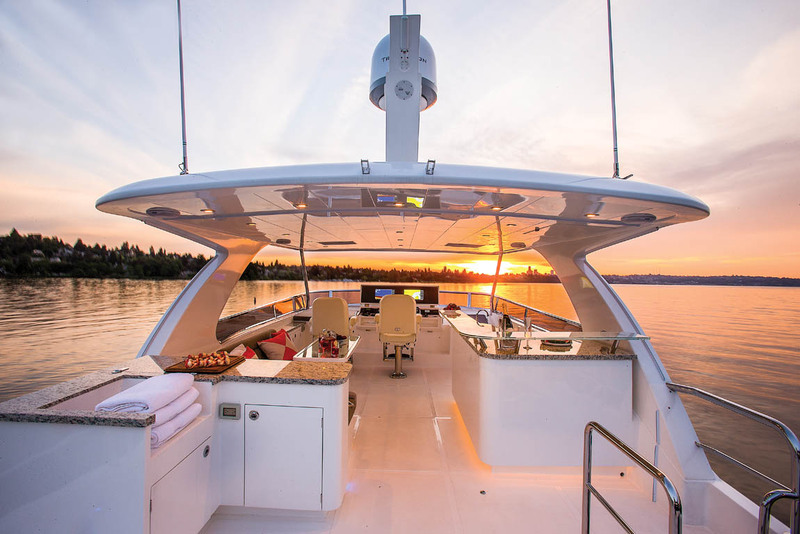 At almost $3 million it is not an inexpensive boat, but if one looks at the value it offers compared to similarly sized yachts, it is a great deal. LOA 66 ft., 9 in. Beam 18 ft., 3 in. 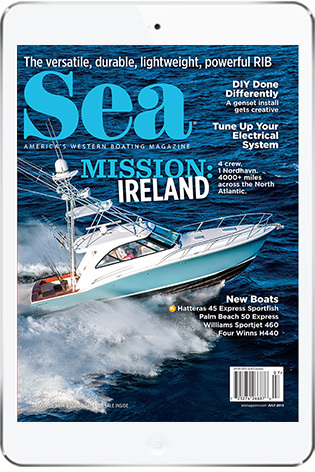 This entry was posted in Boat Tests, New Boats and tagged motoryacht, Pilothouse, Regency P65 Motor Yacht, Regency, deckhouse by bsheehy. Bookmark the permalink.